I don’t normally post any of my poetry on my blog (this is why), but this summer I started trying my hand at blackout poetry just as a creative exercise. Seeing as how these are exercises I never really intend to try publishing, I thought it would be fun to share some of my favorites on here from time to time. At least for now I’m only using books I’ve never read, because I don’t want knowledge of the characters and plot to influence the poems I make. Maybe someday I’ll do a project with a book I’ve read instead. 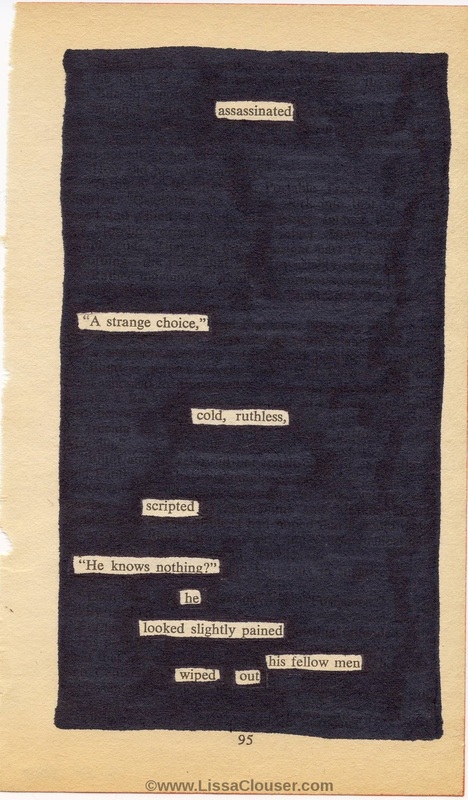 Blackout poetry is when you take something already written – a page out of a book, a magazine or newspaper article, a sale ad, anything! – and black out all but a few chosen words and phrases to create a poem. You’re limited by the words the previous author had already chosen, and the order in which they were written, but other than that it’s up to you! Some people get really fancy with stamps, illustrations, and colors, (you can Google some pretty incredible examples) but for now I’m sticking to the simple and straightforward, armed with only a Sharpie and the page. This page is from Hugh C. Rae’s book “The Traveling Soul”.